Hi all! With Elasticon wrapped up we're back with our weekly updates! Read on for what's new here! 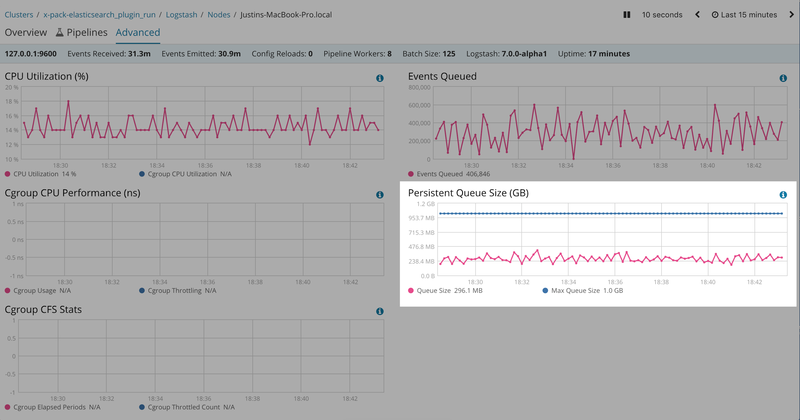 We merged in a patch that will provide a chart that shows the total size and capacity across all persistent queues on a Logstash node. Once this is released, you'll be able to access the chart in the Advanced tab of the Logstash Node Monitoring UI if you have x-pack installed. "Distributor": One pipeline runs a beats input , classifies the data, then sends it to a specific Logstash pipeline for that business purpose. This massively DRYs up the configs, while still letting users use a single port for beats. "Output Decoupler": Users often complain that if one output temporarily blocks so does the other. This feature lets users insert a PQ between pipelines, allowing for temporary buffering if an output does disappear. With the core PR (logstash#9206) open we now have all the code up we'd need to support this. With that PR and logstash-integration-internal#1 inter-pipeline communications work. We do need to put in work to merge this code and ensure that the quality the code is up to par, but we are close. With logstash-input-exec#14 the Logstash exec filter can now be run on a schedule! This means Logstash can repeatedly execute a command a-la-cron (with cron syntax) and ingest its output. This really opens up a lot of use cases for Logstash, and is a welcome improvement! In Jruby 1.7 some ruby constructs can leak memory. This affected the grok filter, which was patched here: logstash-filter-grok#136 . The Beats input can use excessive memory when there are many clients, esp. when pipelining values in the beats client are set to larger values. logstash-input-beats#301 reduces memory usage mitigating this issue. We're hard at work on our new Java API in logstash#9137. We're scoping that PR quite small, bypassing some more complex features and dependency management, but it's an important first step.